SSC CPT (Computer Proficiency Test) includes 3 tests of 15 minutes each .i.e. 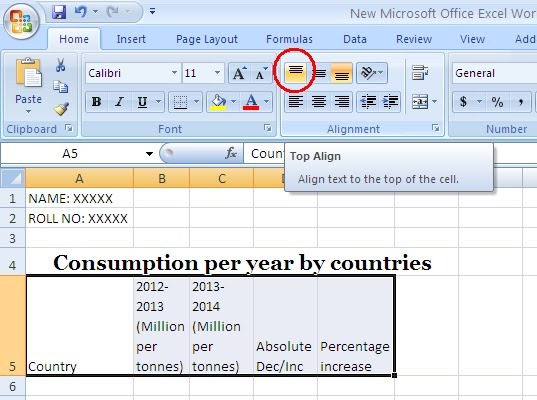 Typing Test, MS office Excel, and MS office Power-point. I have also discussed the detailed information of SSC CPT test- Click here to read. In this MS office is conducted under MS office 2007 software. So, i advice you to install MS office 2007 and practice in that. 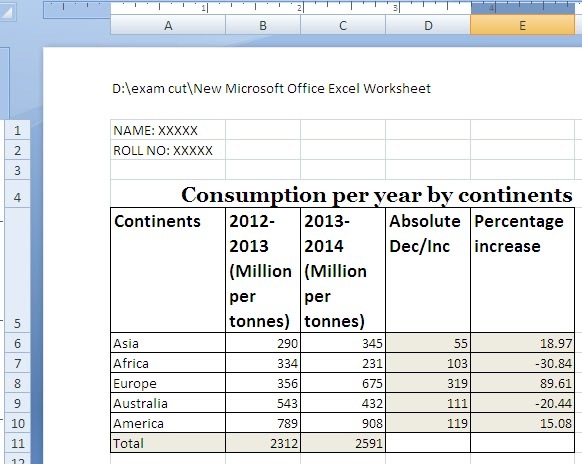 Also Read: Video Tutorial to make Excel Sheet for SSC CPT test. 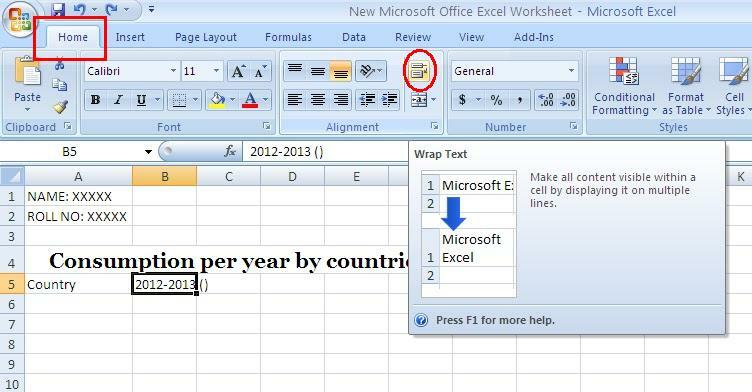 - Here, i have shared the sample excel sheet for practice. I guess, you will see the similar sheet in your exam. As, i have blogged these steps after listening the experience of students of CGL CPT 2012, 2013 and 2014. This process has been repeated since 3 years. So, practice before appearing for CPT test. 1. 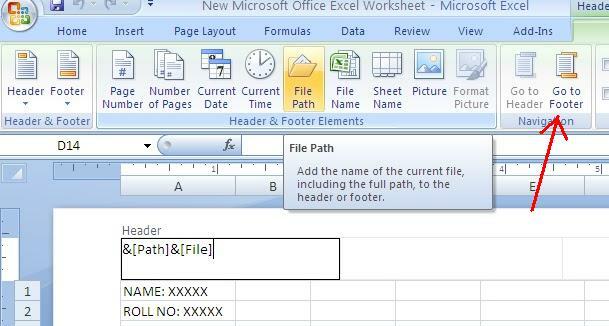 Open MS office Excel 2007 and Write 'Name' and 'Roll No.' in A1 and A2 cells respectively. Important Note: I advise you to select 'Page Orientation' in Page Layout tab. 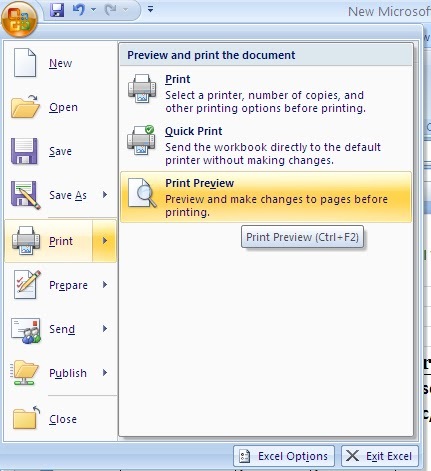 It will help you analyze that your print won't come in 2 pages. This also can deduct 10 marks, if print of your Excel sheet comes in 2 pages. 2. In 4th row, Write 'Title' with font-size of 18 and 'Merge and Center' the cells from A4 to E4 by selecting cells from A4 to E4 and then, go to Home tab and select 'Merge & Center' option as shown in the above figure. 3. 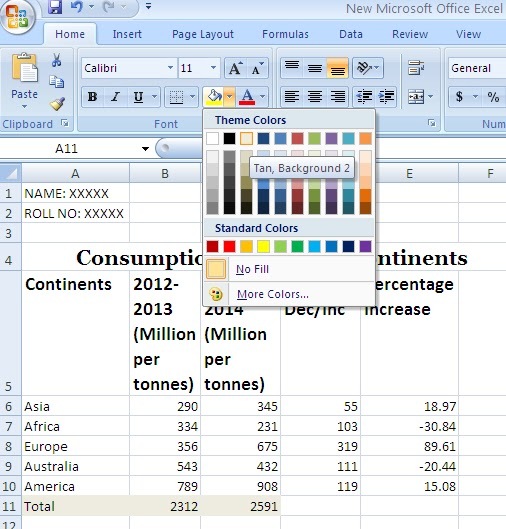 Write the contents with Sub-titles as shown in the Sample Slide. - While writing you will need to Wrapping of the text(requires when text exceeds the single cell). For this, go to Home tab and Select the 'Wrap Text' option as shown in the above image. 4. 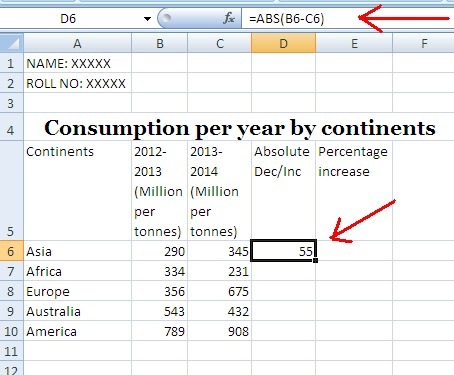 Use 'Wrap Text' option whenever the text exceeds the cell. If you don't do Wrapping of the text, your content may exceeds the Print Out area horizontally. '=' sign is important to add before the function. 6. Now, you have to repeat the same function other cells too. For this, just copy the cell (as i have selected the cell D6 written with '55') and paste in other cells below. (Refer image for more info). And Repeat the same for other cells too. 8. 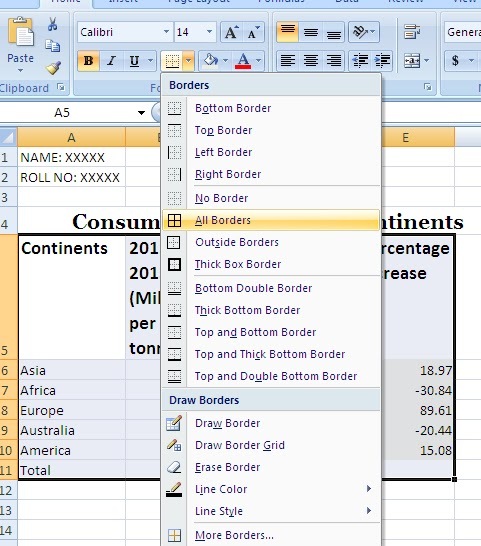 To use 'Auto Sum' option. 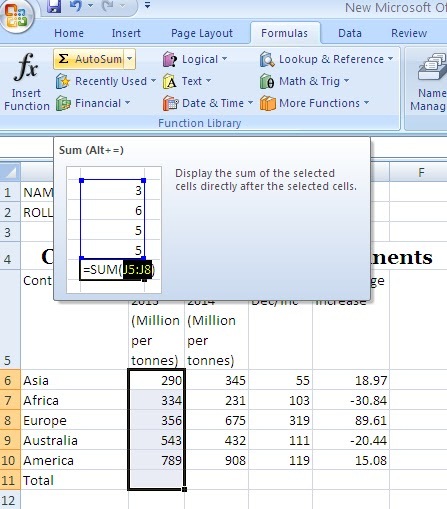 First, select the cells to add and then, Go to 'Formula' tab and click on 'Auto Sum' option. Auto Sum will be done automatically with answer in the Blank cell selected. 9.Now, Align the titles of the text to top. For this, go to 'Home' tab and select the 'Top Align' option as shown in the above image. 10. Now, you have border the text all around. This is also important and should be added carefully. 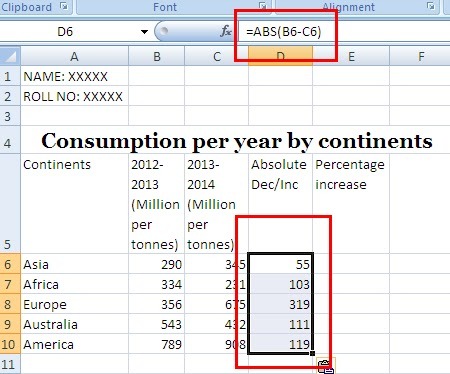 Select whole text below the main title (from A6-A11 to E6-E11) as shown in the figure. Then, go to Home tab and select 'All Border' option as i did in the above screenshot. 11.Now, Grey color the rows and column of only Total, Absolute Inc/Dec and Percentage. So, select color the column and rows accordingly. 12. This is the important point. Here, you have to Header and Footer. For this, go to Insert tab and Click on Header & Footer option. You will header and footer is divided into 3 column automatically. - Now, add File path (as shown in the figure) in the left column of header. 13. Then, click on 'Go to Footer' option as shown in the above figure. You will be automatically shift to the footer. 14. Now, add 'Date and Time' ,Name and Roll no in the respective Footer columns. (Refer the image above 13th point). 15. 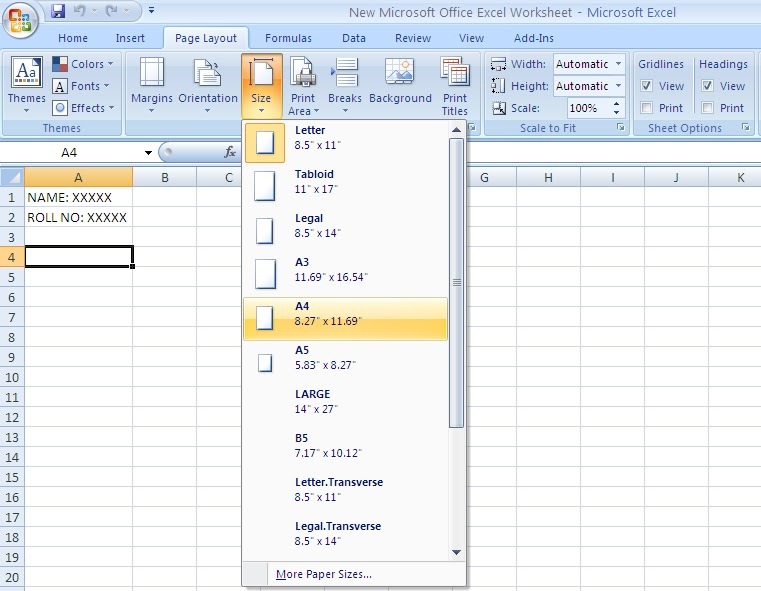 I advise in the last must have a Print Preview for your Excel sheet. And make sure, your printout will come accordingly and not on 2 pages or something is not missing. Comments "Step by Step to create Excel Sheet for SSC CPT test"